Find our recap, and media coverage of this event HERE. A recent report to the United Nations from the world’s leading climate scientists indicates the humanitarian crisis and scale of ecological devastation to come has seen no precedent in human history. Likewise the scale of needed intervention requires an unprecedented, united will and effort. Are we up for it? 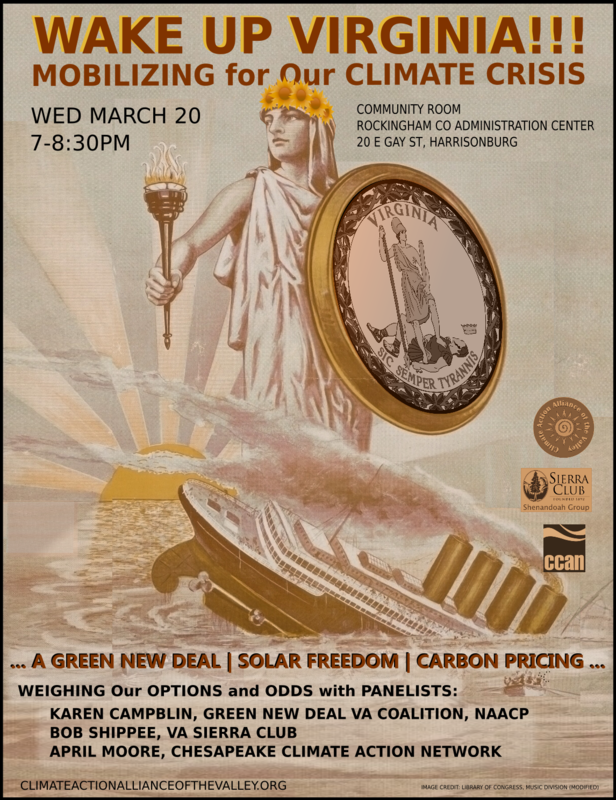 The Harrisonburg-based Climate Action Alliance of the Valley (CAAV) has invited three regional experts in Virginia climate legislative initiatives for a panel discussion focused on current efforts and next steps needed to turn the tide of the climate crisis and slow our sinking ship! The program, “Wake Up Virginia!!! Mobilizing for Our Climate Crisis,” will be held on Wednesday, March 20 at 7PM at the Rockingham County Administration Center in Harrisonburg. In addition to looking at efforts now underway, it will explore options and possibilities, including the hope, scope and promise offered of a Green New Deal, and concrete actions for audience members. “Wake up Virginia!!! Mobilizing for Our Climate Crisis” will feature Karen Campblin of Fairfax, Co-Chair of the Green New Deal Virginia Coalition, and Environmental and Climate Justice Chair for the Virginia NAACP; Bob Shippee of Richmond, Legislative and Political Chair of the Sierra Club Virginia Chapter; and April Moore of Shenandoah County, member of the Chesapeake Climate Action Network Board of Directors. CAAV is encouraging all citizens to attend! There will be a drawing for some great door prizes after hearing from the guest panelists and an audience question and answer segment. The event is co-sponsored by the Shenandoah Group of the Sierra Club and the Chesapeake Climate Action Network. Karen Campblin of Fairfax is Co-Chair of the Green New Deal Virginia Coalition, and Environmental and Climate Justice Chair for the NAACP’s Virginia chapter. Green New Deal Virginia’s co-founder, Delegate Sam Rasoul of Roanoke, says that environmental, economic and social justice cannot be separated. A Green New Deal, he believes, would give Virginia a way to greatly reduce poverty and bring economic prosperity by “creating tens of thousands of good paying jobs in clean energy”. Richmond resident Bob Shippee is Legislative and Political Chair of the Sierra Club Virginia Chapter. As Legislative Chair, he tracks legislation, does lobbying, leads the chapter’s legislative committee and collaborates with them to develop position papers. Sierra Club is the largest grassroots environmental organization in the country. CCAN’s website says its major successes, since its founding in 2002, include cleanup of coal-related mercury in Wise County, cleanup of three dump sites of coal ash in Maryland, an anti-fracking law and strong carbon cap in Maryland, and the groundbreaking Clean Energy DC Act of 2018 in Washington D.C., the strongest climate law in the country. Please share this event with friends, family, and community groups! Printable flyer is HERE. Big thanks to our Oct 24 presenters Case Watkins and Kendall Sellars (both in photo at right), and the Nov 17 speakers Chris Bolgiano and Kate Holcomb, for all their great presentations for this two part series! the Stand4Forests website that goes over the ideals the platform is founded on. We cherish our forests for many things, their beauty, their grandeur, and for all our memories of special childhood, youth and adult experiences there. They give us oxygen, plants, animals, healthy soil, clean water, beauty, peace, and re-creation in the fullest sense. Are forests essential for our future? What action, if any, do we need to take to protect our forests? The Climate Action Alliance of the Valley, invites the public to explore these questions in a two-part education series titled “Dissent as Defense of Our Forests and Future”. It will be held at the Rockingham County Administration Building, Entrance A, at 20 E. Gay Street, Harrisonburg, 7pm, on these two Wednesdays: October 24 and November 14. Part one, “The Power of Dissent” is a lecture by Dr. Case Watkins, October 24 at 7pm. Watkins, an Assistant Professor in the Department of Justice Studies at James Madison University (JMU), will talk about the importance and necessity of dissent for social change. His focus while teaching at JMU has been to realize and integrate social, global and environmental justice. He draws on experience in New Orleans, Portugal and Brazil to understand these issues, especially for rural communities and communities of color. Part two, the second lecture, on November 14 is “Forests Are Our Future” by Chris Bolgiano, who will explain the national campaign, Stand for Forests. See https://stand4forests.org/. A Wild Virginia representative joins her to speak on “What Can We Do Now?”. Both events are free and open to the public, and there will be time for questions. All are invited to come to a public presentation by James Madison University Professor of Anthropology, Megan Tracy, to discuss the impacts of meat-based diets and food waste on global warming. Listed as the third and fourth most impactful actions in the solutions list in Paul Hawkens’ book, Drawdown: The Most Comprehensive Plan Ever Proposed to Reverse Global Warming, curtailing food waste and switching to plant-based diets offer significant reductions in carbon emissions to control climate change. A representative of the Friendly City Food Coop will join us with samples of meatless meats! Incorporating meat substitutes into meals can be helpful in transitioning to eating less meat. This is the first of a three part series hosted by the Climate Action Alliance of the Valley to examine Solutions to Save Us. “Plant-rich diets reduce emissions and also tend to be healthier, leading to lower rates of chronic disease. According to a 2016 study, business-as-usual emissions could be reduced by as much as 70 percent through adopting a vegan diet and 63 percent for a vegetarian diet, which includes cheese, milk, and eggs. $1 trillion in annual health-care costs and lost productivity would be saved. In March we’ll look at solutions 6 and 7, Educating Women and Family Planning, and in April we’ll learn about the surprising top solution, Refrigerant Management. This presentation was covered by Daily-News Record reporter Ellie Potter. Her article was published on September 20, 2017: 7.5 Billion’s A Crowd. Thanks for this great article Ellie! Education is one way to help with population control, by teaching families how to plan their families. Educated women tend to be more career-driven, marrying and starting families later in life, he said. But combating the problem across the globe is challenging when each country addresses its population growth differently. Solving the climate change crisis is all about getting off fossil fuels, right? Install solar, switch to LED lighting, eat less meat, recycle, carpool and use alternative transportation. You’ve heard this over and over. Yet, there’s an “elephant in the room” not getting the attention it deserves. Humans have achieved unprecedented population levels. From about 1.5 billion in 1900 to currently 7.5 billion and projected to reach 10 billion by 2050. Fossil fuels have propelled unparalelled growth and success of the human species. It is the Anthropocene after all. Sustainability will take more than changing our energy source. History Professor Michael Galgano teaches global population issues at James Madison University. We’ve invited him to address how our sheer human numbers factor into the race to preserve enough natural resources for our continuing success. Please join the Climate Action Alliance of the Valley at the Harrisonburg Downtown Massanutten Regional Library on Tuesday, September 19 at 6:30 PM for this critical discussion. US Marshalls like Wyatt Earp helped clean up the lawless old West—can Southern Environmental Law Center (SELC) lawyers help clean up the chaos of climate change? Can a small group of kids (Our Children’s Trust) and their lawyers demand their, and our, right to a livable planet? We can meet, we can march, we can lobby, write letters, sign petitions, and put up solar panels. But when it comes right down to it, we live in a nation governed by the rule of law, “of the people, for the people, by the people,” and when laws are unjust, or when just laws are attacked by special interests, we also have recourse through the courts. Speaker Will Cleveland has worked on Virginia’s Clean Power Plan, uranium mining, solar power, retiring outdated coal burning plants, biomass energy, and the power of energy efficiency among other issues, in his years at SELC so he can address almost any problem you’d like to bring up. See short films about the case and some of the youth involved and learn the background and current status of this groundbreaking lawsuit. Joni Grady with presenters Francis Lopaka from the Democratic Republic of the Congo, Diana Tovar of Columbia and Marites Cortes from the Philippines. Joni Grady giving background on Columbia. Marites (Tess) Cortes from the Philippines. Photo courtesy of Hannah Geisen. Francis Lopaka from the Democratic Republic of the Congo with his sister doing translations. Photo courtesy of Hannah Geisen. Diana Tovar from Columbia. Photo courtesy of Hannah Geisen. The presenters. Photo courtesy of Hannah Geisen. Photo courtesy of Hannah Geisen. JMU students who provided background information on the countries featured along with event guests and organizers. Photo courtesy of Hannah Geisen. Thanks to Marites Cortes, Francis Lopaka and Diana Tovar for their perspectives on changes in their countries due to global warming! We hope to keep the conversation going. The Climate Action Alliance of the Valley presents speakers from the Philippines, the Democratic Republic of the Congo and Colombia on Monday, November 28th at 7:00pm, Simms Center Auditorium, to share their experiences of climate change with us. People around the world are being affected right now by extreme weather events, ocean acidification and droughts made much worse by climate change. All but the richest countries are struggling to improve the lives of their citizens with more electricity, better transportation, and greater industrialization. All of these increase CO2 emissions if done with fossil fuels. It is even more important now with the Paris accord under attack that you join us so that we can all begin to understand the immensity of the problem and the necessity for working together to solve it. Marites Cortes, Francis Lopaka, and Diana Tovar will be speaking. Parking is available one block away at the Water St. parking deck, or the municipal lot behind City Hall. Get the latest in-depth info on what’s happening in Richmond’s General Assembly this year that affects solar, efficiency, Dominion Power and pipelines. The speaker is Hannah Wiegard, Virginia Campaign Coordinator with Appalachian Voices. There will be time for discussion of what we can do in the valley and questions from the audience. Thanks to Alan Williams for an interesting and informative presentation with lots of amazing photos! And thank you for your dedication to this difficult work. The Climate Action Alliance of the Valley presents the inside story on fighting western forest fires, from training to living in camp to the actual hard and very dirty work of controlling a wildfire, from Shenandoah National Park’s Alan Williams. Alan Williams is an Ecologist/Data Manager for Shenandoah National Park (SNP). He works on projects including water quality, aquatic invertebrate monitoring, native trout monitoring, non-native plant monitoring, forest health, rare plant monitoring, and Peregrine Falcon restoration. He is also a member of the park’s technical rescue team and wildfire fighting crew. 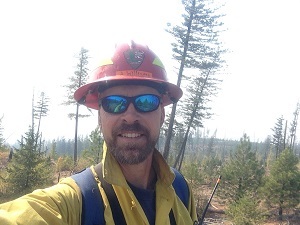 On Monday, October 26 at 6:00 PM at the Harrisonburg Downtown Library, Alan Williams will share with us his experiences working western wildfires as well as what firefighting means at SNP. 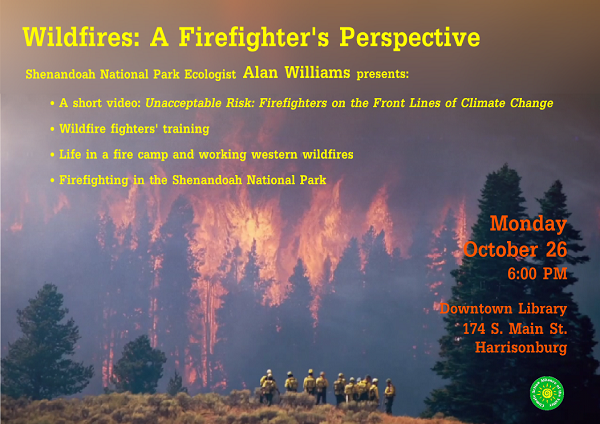 Alan Williams is an ecologist and wildfire fighter with the Shenandoah National Park. Come to watch “Unacceptable Risk: Firefighters on the Front Lines of Climate Change.” Produced by The Story Group, this short video “focuses on the people battling to save lives and property in a rapidly changing environment.” Then hear Alan present about training for fighting wildfires, life in a fire camp, working western wildfires, and wildfires and the Shenandoah National Park. We will have time for questions following the presentation. 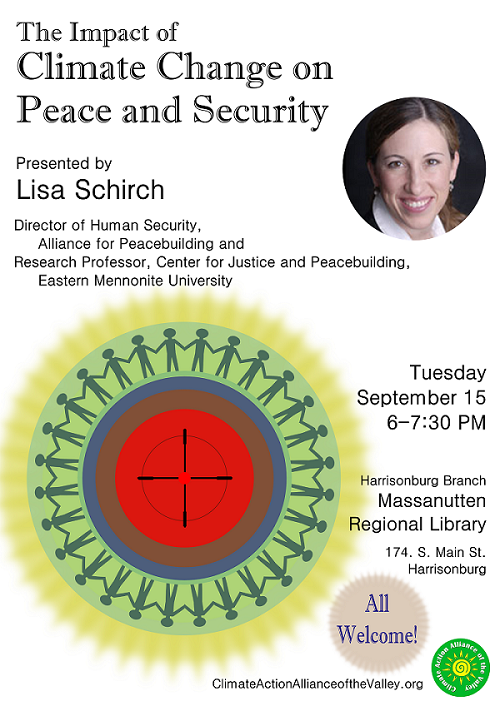 On September 15, 2015, the Climate Action Alliance of the Valley will present a public talk by Dr. Lisa Schirch on the Impact of Climate Change on Peace and Security. Schirch is Director of Human Security at the Alliance for Peacebuilding, and Research Professor at the Center for Justice and Peacebuilding at Eastern Mennonite University. The talk won’t go into the settled science but will instead go over the impacts of climate change, seeing how the different impacts are related, and looking at the world as a community so that we can collectively address and conquer this major threat. In addition, John Eckman, Executive Director of Friends of the North Fork of the Shenandoah River, will discuss the issue as it may more narrowly impact the Valley. Please join us for this presentation on Tuesday, September 15, 6:00PM, at the downtown Harrisonburg library, 174 S. Main St., Harrisonburg.